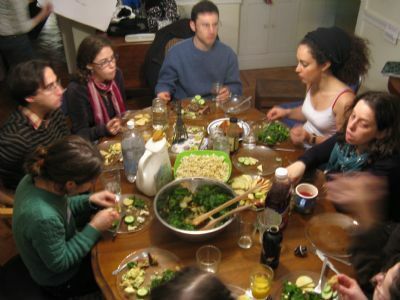 Join us twice monthly for lay-led, egalitarian shabbat services, followed by a delicious vegetarian potluck dinner. This month, services will be held on August 13 and August 27. Click here to see our full calendar. Services are led by different people each week. Our prayerbooks have Hebrew, English and transliteration, and services are always egalitarian, friendly, informal and musical. If you would like to lead one week, please email moishehouseboston@gmail.com. Dinner is potluck style, and all food is vegetarian. If you need hechshered [fully supervised] kosher food, please let us know in advance and we will make sure to have more of it. For more information about kashrut at Moishe/Kavod House, please click here. In recent months, we have also been supporting people in hosting their own smaller, less overwhelming ‘Kavodelehs’ in their local neighborhoods. If you would like to host – or be invited to – a Kavodeleh, please contact juliearonowitz@gmail.com.